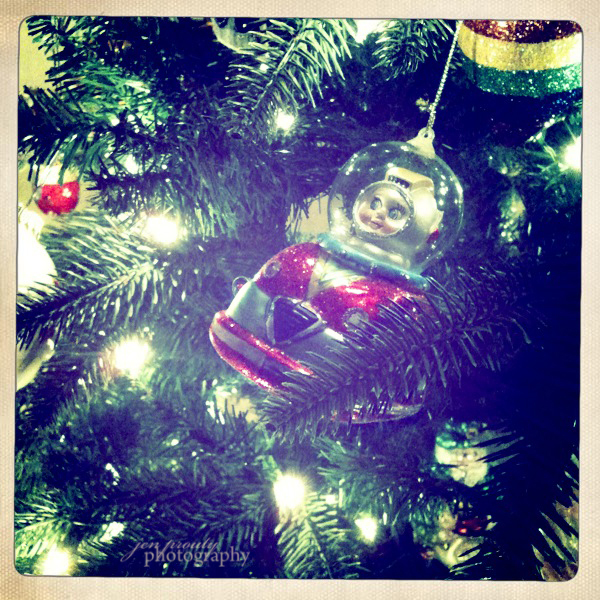 Today's ornament: vintage rocket boy. Story: The truth is, this ornament doesn't have a story. Correction: it actually does have a tragic story but I'll get to that in a minute. 2 years ago...Saugatuck. We saw it. We loved it. We bought it. I say it doesn't have a story because we bought it purely on impulse. It is one of the few ornaments on our tree that doesn't have epic connections or history to our lives. We just love it. Correction: LOVED it. Three nights ago. We put our tree up. This was the first picture I took. There is just something about it that I love. (LOVED). We decorated our tree. Secured each ornament carefully. Then shut the lights off and headed to bed. 3:32 AM. I am woken by a crash. It was the most dreadful, shattering glass, kind of crash you don't want to hear ever. Especially at 3:32 AM. Have you figured out where this story is going? I couldn't bring myself to go down and look in the middle of the night, hoping if I went back to sleep it would be nothing more than a dream. I got up the next morning to find my beloved vintage rocket boy shattered into a zillion pieces. I have done a quick Internet search to try to locate another replacement but am coming up empty-handed. All I know is it is an 'Old World Christmas' brand ornament. This is where you come in to play dear friends of mine. If any of you have any extra free time and can locate another one on the Internet for me to purchase, I am willing to purchase a second one (or a different ornament (your choice) up to a $20 value) as a thank you gift for doing my dirty, internet-searching work for me. Let me know if you have any luck!! !